Stellerite is an uncommon member of the zeolite group, and is very similar in structure and formation to Stilbite, with a general formula of Ca[Al2Si7O18]·7H2O. It is named after Georg Wilhelm Steller (1709–1746) a famous German explorer, physician, and zoologist. 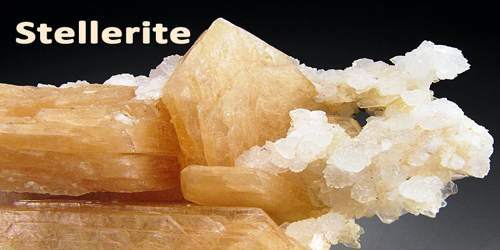 Like most rare minerals, there aren’t many commercial uses for stellerite yet. Mineral collectors are lucky to find it in good enough crystal form. Zeolites, including Stellerite, have been studied using a dehydration process to gauge the potential use of their phases as molecular sieves, sorbents, and catalysts. Steller first discovered this mineral on the Commander Islands, which is also known as the Komandorski Islands in Far East Russia. Aside from being the first to explore these islands and discover this new mineral, Steller is also credited for identifying several animal species that were named after him, such as the Steller’s sea lion, and the now-extinct steller’s sea cow. Stellerite is present in some of the important zeolite deposits and can be mistaken for the much more common Stilbite. Bright orange Stellerite in large crystal groups are well-known from the Sarbaiskoe (Sarbai) and Sokolovskiye Mines, Kostanay Province, Kazakhstan. 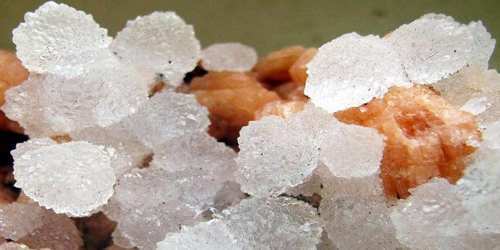 Large and beautiful crystals occur in several of the famous zeolite localities in Maharashtra, India, including Pune (Poona), Jalgaon, Aurangabad, Nasik. In Australia, large, individual, peach-colored Stellerite crystals come from Garrawilla, Gunnedah, and Tambar Springs, all in Pottinger Co., New South Wales. Yellow Sterllerite comes from Malmberget, Lappland, Sweden; and white microcrystals from Gibelbach, Fiesch, Switzerland. Stellerite is part of the orthorhombic crystal system which means it has three axes of unequal length that intersect at 90° angles. Its crystal class is rhombic-dipyramidal which means it has three perpendicular two-fold rotational axes with perpendicular mirror planes. Its crystal most often as rounded, radial groups. The groups can be clustered together or in separate balls, and may form as perfectly rounded formations. Also in platy aggregates, and in distinct curved aggregates of fan-shaped, wheat sheaf, or bow-tie bundles. Individual crystals, which are rare, are in flat tabular crystals with pointed tips. 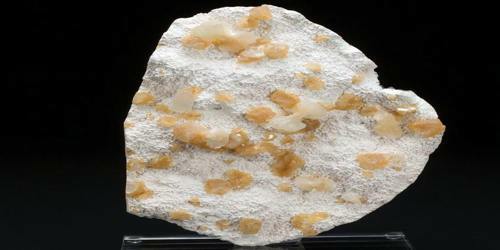 Stilbite, another zeolite, is very similar to stellerite in both chemical composition and physical appearance. 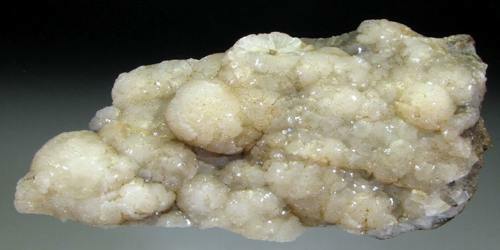 Stellerite is more commonly found in rounded radiating clusters or as single crystals and appears more transparent than stilbite does. Stellerite is an anisotropic mineral, meaning that it has different properties in different directions-such as indices of refraction-when light passes through it. A refractive index (n) measures the speed of light in a substance or in the case of mineralogy in a mineral. It is expressed as a ratio of the speed of light in a vacuum to that in a mineral. Stellerite has three indices of refraction because it is a biaxial mineral.